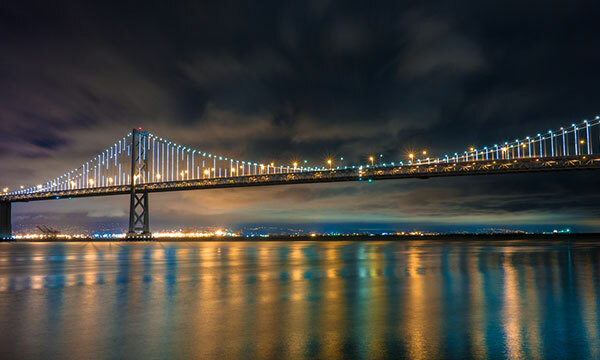 The San Francisco-Oakland Bay Bridge will be closed indefinitely while crews repair an upper-deck cable that snapped during rush-hour on Tuesday evening. According to the AP, the broken cable and a chunk of bridge metal fell onto the westbound lanes, damaging at least one vehicle. The cable that snapped was put in last month to repair a crack that was discovered over Labor Day weekend. While the issue is repaired, other forms of transportation will double up their efforts to keep people moving on trains and ferries. The snapped wire could be a sign of more repair work to come, though. As quoted in the Los Angeles Daily News, a civil engineering professor at UCLA Berkeley called the initial crack a “warning sign” of more problems. He said the repair was really just a Band-Aid and “demonstrates the need for a longer-term solution.” The bridge is 73 years old and carries around 260,000 people each day. I almost didn’t register it the first time I saw it. I figured that they couldn’t really mean Labor Day weekend–a holiday weekend when everybody’s driving somewhere. Take note, visitors of San Francisco this Labor Day weekend: plan ahead to avoid the Bay Bridge! The closure starts Thursday, September 3rd at 8:00 p.m. and ends by Tuesday, September 8th at 5:00 a.m. If you’re driving, be sure to allow extra time to get around the bay and cross other bridges. You’ll want to check baybridgeinfo.org for closure details, and follow 511.org for traffic conditions, detour routes, and other transit options (ferries, BART, MUNI). This is just the latest phase in the bridge’s construction–in the works since the 1989 earthquake forced either retrofitting or replacing the bridge’s eastern span. During this weekend’s closure, a 300-foot section of the old bridge will be rolled away and replaced with a new section that connects to a detour. Officials say they specifically chose this weekend for the closure because it’s typically light on traffic. This picture taken by jrodmanjr of a fireworks display in San Francisco really caught my eye. Notice how the bright lights coming from the Bay Bridge create a bit of a vignette around the picture. The low light makes it tough to get a super crisp shot in these situations, but jrodmanjr did a nice job with this one. Every picture in his photostream could qualify for a Photo of the Day! Are you a Flickr user who’d like to share a travel related picture or two for our consideration? Submit them to Gadling’s Flickr group right now! We just might use it for our Photo of the Day!